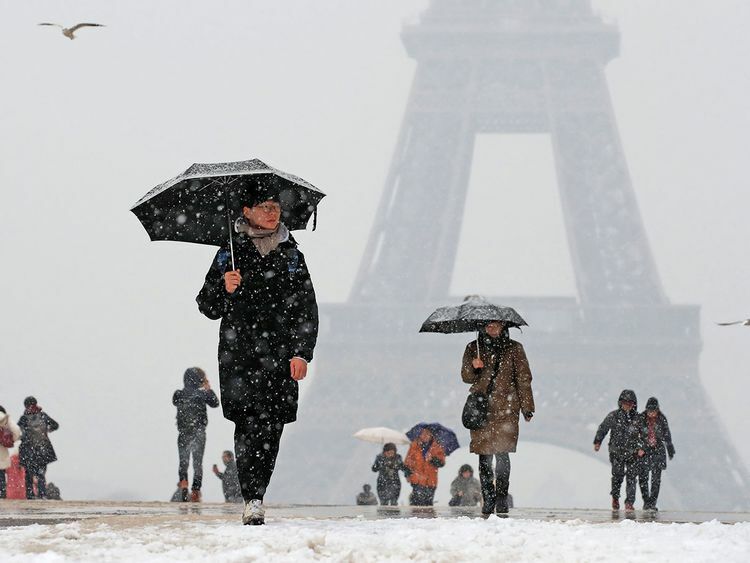 PARIS: Paris got its first snowfall of the season on Tuesday, prompting travel alerts for commuters but giving snowboard enthusiasts a chance to hit impromptu urban slopes. Last year, nearly 1,000 vehicles were stranded on the stretch of the RN118 highway, forcing almost 2,000 people to spend the night in their cars. Officials were determined to avoid a repeat, and city workers had already begun salting intersections around the capital on Monday. The RN118 reopened in the afternoon but speed restrictions were in effect, and the road was due to be closed to truck traffic again from 9pm as a new storm front approaches. “It’s limited for now, there are a few centimetres, up to two or three maximum,” said Francois Gourand of national forecaster Meteo France. More snow is expected later on Tuesday, with temperatures hovering around zero Celsius. “All of a sudden we’re going to have one or even one and a half metres on average,” he said, warning of avalanche risks starting on Wednesday. Meanwhile, a warning of icy conditions is in place for almost the whole of the UK on Tuesday, prompting police to urge drivers to slow down. The yellow “be aware” warning covers Scotland, Northern Ireland and the bulk of England and Wales apart from some coastal areas. The wintry weather front continues to bring snow on higher ground and occasional dustings at lower levels. The Met Office warned of further brief spells of wet snow on high ground in southern Scotland, northern England and north Wales. More snow will then follow from the north-west, with up to 3cm on higher ground and some covering on lower ground. Police Scotland warned drivers to expect poor driving conditions.